It was featured on Thingiverse and published by user jjshortcut (Jan-Jaap). Since for some time I got hooked on toying with microcontrollers, robots and other electronics, I decided to give it a try and build it myself. In this post I will describe the hardware build of the arm and in later posts I will be writing about the software to control it. Another reason to build the arm myself was the cost factor. Even small commercial robotic arms are quite expensive – products from Lynxmotion and Dagu look great but both cost around USD $300 (actually there is one cheap arm available but it looks more like a toy to me). In comparison this design is quite cheap. It uses seven hobby grade servos and even the cheapest ones should work fine. The structure is build from a set of laser cut parts connected with few metal spacers (15mm and 47mm) and lots of M3 screws. Other than that you’d only need a microcontroller board to drive the servos. So in total it comes a lot cheaper to build it yourself than buy an of the shelf robotic arm. 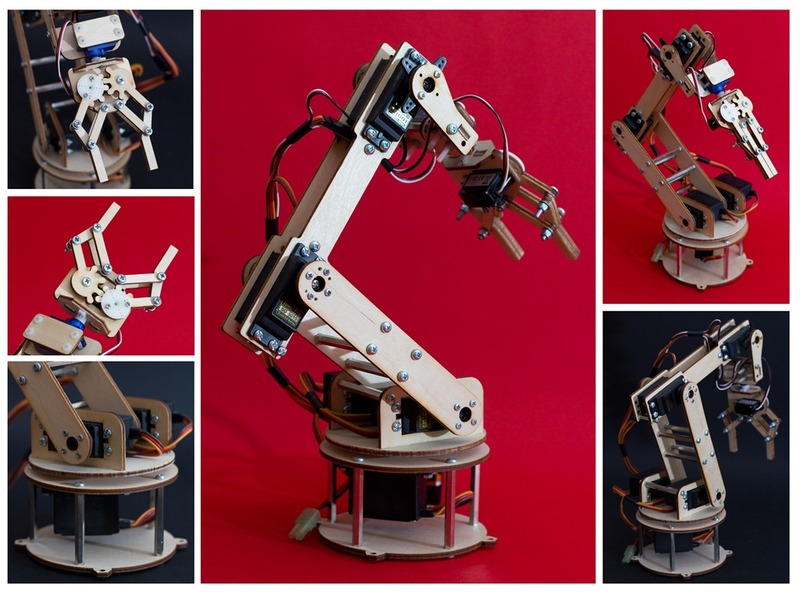 Oh, and if you don’t like this one there are few more robotic arm projects at Thingiverse (including one by oomlout). Some time ago I’ve build another robot using laser cut parts so I knew the process already. You can grab the design files in both DXF and EPS format from Thingiverse, and there are also 3D models of each part in STL. Actually the design is split into a second project for the mini servo gripper (there is also a standard servo version available but it won’t fit this arm). I wanted to make some small adjustments, layout, and add measurements to the parts before sending it for cutting. 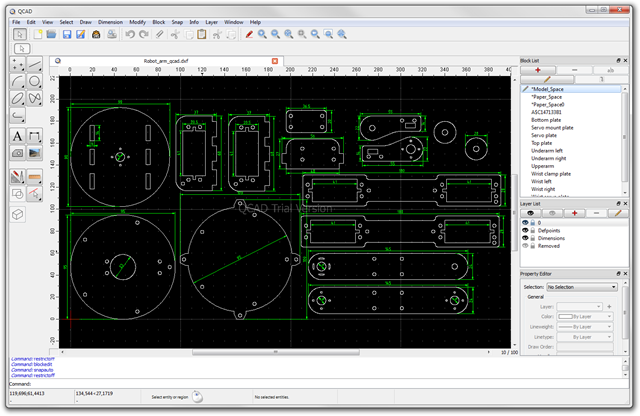 I’ve looked at some free 2D CAD programs, and finally did all this work using QCad 3 Beta with worked great for me (I also tried LibreCAD but it didn’t work that well). All parts are cut from 4 mm thick material. Because I was worried that acrylic is too fragile and might break, I also ordered another set cut from plywood. In the end I build it from plywood because it was easier to glue (I was told acrylic requires a special glue). Btw. I found a great laser cutter service in Kraków and highly recommend it (www.ebbox.com.pl). It cost me only USD $26 for both sets ($16 acrylic + $10 plywood). I bought all the M3 screws and nuts at local hardware store. Make sure to look for nylon lock (nyloc) nuts for the gripper because otherwise it unscrews and comes apart quickly. I couldn’t find local store with metal spacers and had to order them online (you’d need 11 x 47mm and 3 x 15mm). I think I paid less than USD $10 for all metal parts. 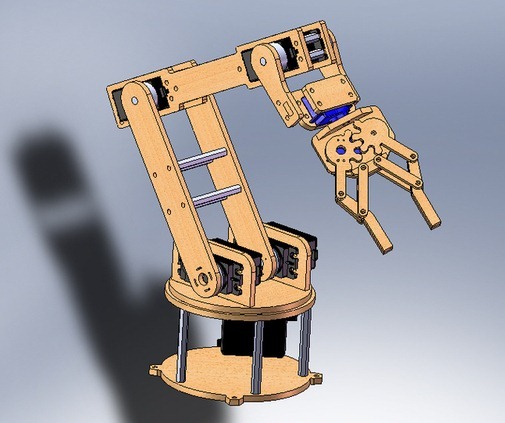 This arm uses five standards size servos to drive the arm itself, and two micro servos are used on the gripper. Author of the project used Modelcraft RS-2 Servo and Modelcraft ES-05 HT Servo. I had two Futaba S3001 servos laying around, and ordered additional TowerPro SG-5010 standard size servos and TowerPro SG90 micro servos. However it turned out that the SG90 won’t fit in the gripper so I had to replace it with a slightly smaller E-Sky EK2-0508 micro servo. Later it also turned out that Futaba servos make some strange noise while working so I swapped one with TowerPro SG-5010 which has higher torque (8kg / cm). I’ve also bought three servo extension cables. All servos cost me USD $45. The last piece of hardware I needed was an electronic board that would take command from PC and drive all seven servos. I could probably use Arduino for this task, and in fact there are several Arduino servo shields available (for example from Adafruit or Renbotics). However one problem is that most support only up to six servos, and second that their accuracy is limited by Arduino’s timer frequency. So instead I looked for dedicated servo controller and found a series of Maestro boards from Pololu. I picked the Pololu Mini Maestro 12-Channel USB Servo Controller. It has many nice features including native USB connection, high resolution pulses (0.25µs) with no jitter, built-in speed and acceleration control, and even scripting capability. 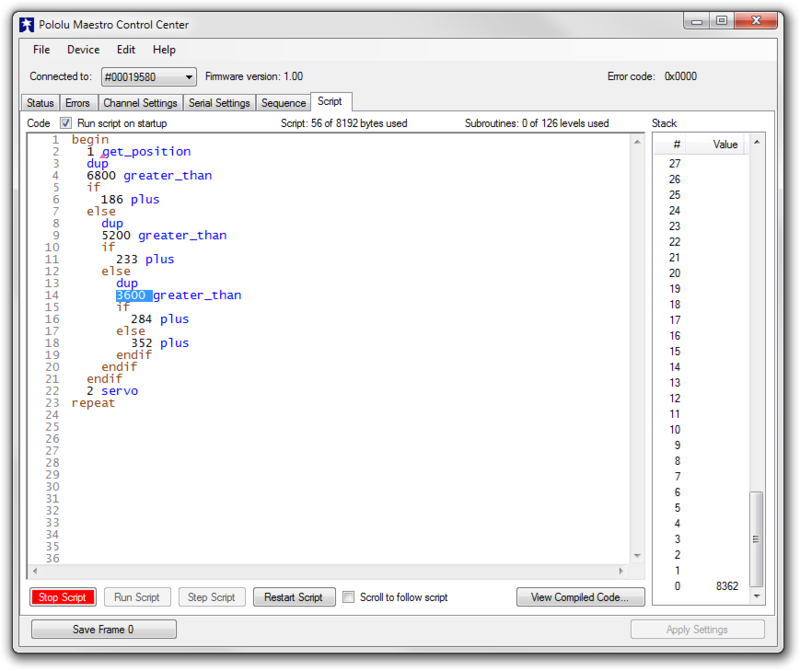 Another cool feature is that besides servo control, each channel can be configured as either general input or output. So far I’m using seven channels so I still have five available to connect some sensors (for example distance sensor mounted on gripper might be useful). And last but important factor was that they have SDK in .NET – what more I could wish for! The board itself is very small – half of the size of Tic-Tac box. I picked one for about USD $35 in this store. Perhaps another good alternative would be the Phidgets Advanced Servo 8-Motor – but it is significantly more expensive at USD $87.30. The Maestro Controller Driver and Software package includes Maestro Control Center program with lets you immediately configure the board. For each servo I first figured out their move range and set the min/max limits. I played with setting the speed an acceleration values as well. Big issue for me was that there are two servos that control position of lower arm (shoulder joint), and both have to be moved at the same time. This is where the scripting feature of Pololu board turned out very helpful. I wrote a script that synchronizes position of second servo with first one – so now I only need to move one servo and other will follow automatically. This turned out tricky because I couldn’t find simple offset mapping of the move range for each servo – I had to divide it into several sub-ranges and map each individually. The scripting language is bit assembler-like but gets the job done. And there is even a runtime debugging and stack view available. Altogether I’m very happy with the Pololu Mini Maestro Servo Controller, and with this final piece I completed the build and was able to move my arm from the Meastro Control program. So here you have all the information about the hardware. In next post I’ll start talking about the software that I wrote in Microsoft Robotics Developer Studio 4. Stay tuned! I've got a friend who's working on a semiconductor company and he shows me how he do his work. I remember seeing same type of robot arm to pick and place or test some electronic parts. I'm really amazed with all these stuff specially on teaching robot points. could you please send me the dimensions of this arm such as the diameter and the length of the lower arm. Can you send your Cad file for the parts? Also, what was different about your parts than the ones originally drawn by jjshortcut? Did you use his stock gripper design? Here are the original files and info this arm is based on. 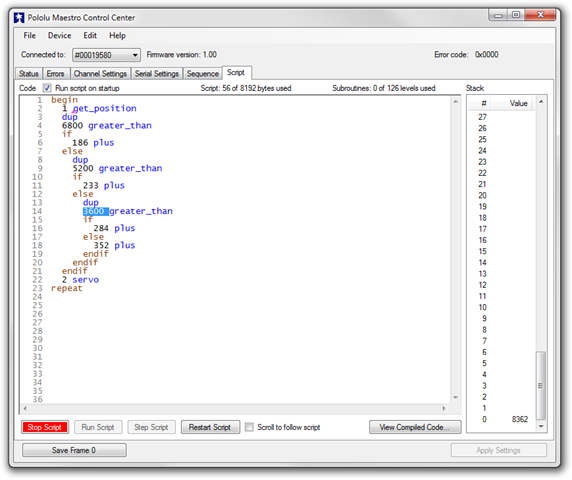 Can you please share with us the entire code for Pololu Controller. Did you manage to stop the wobbling of the base? If not, then perhaps three ball bearings mounted in the base as supports for the platform should keep it from tilting. Cut slots for the bearings and mount them underneath...? Your laser service website is only in polish, can you help me if I choose to order these parts from them? Nice job, and good blog. Thanks! can u please help me out with the coding part. heyy friend i m a robotic hobbyist and planning to build a rovbotic arm as urs.......i m very much amazed by ur work....so can u please send me complete electronics details regarding ur arm.......looking forward for ur reply.....!! Hey, how lot you think that arm can handle in lift? Im thinking of making robot that takes stuff from fridge and comes back to me. Tho it should lift at least 350grams. Do you think this desing could handle that? I see you used some various sizes of servo. Can you tell me wich servo how many need? Hello! I made this robot with the TowerPro servos and the Mini Maestro but servos shake and vibrate when I power them through the maestro. Did you have this problem at all? Many thanks! Can you send your Cad file for the parts?could you please send me the dimensions of this arm such as the diameter and the length of the lower arm. Can you send your Cad file for the parts? Can you please send your CAD file with all the dimensions ? Hi, that was so awesome, special thanks to the designer and to you for sharing this design free. I made this project but, I changed the base and add some joystick and buttons to it.